For my 12th birthday my dad gave me a Zenit-E single lens reflex camera. This summer, over 40 years later, I came across it while sorting through some boxes, and it all came flooding back. At the time I was using a basic point-and-click Kodak Brownie box camera, so handing me a Zenit was a major upgrade. It seemed impossibly complicated at first as taking a decent picture required giving attention to at least 4 related variables; light intensity, focus, aperture and shutter speed while also evaluating their impact on depth of field and picture sharpness, all before getting around to picture composition. If you wanted to capture the moment, you needed to prepare several minutes in advance, twiddling dials and interpreting and transferring information from one to another. Still, thanks to the flap-up mirror shutter mechanism, at least you got to look through the lens at the exact view you were photographing. The gift was a bit of a risk for my dad in several ways. First, my track record with technological appliances was not good; I had managed to break a basic record player on the first day of ownership the year before. Second, I hadn’t asked for a new camera and wasn’t particularly keen on photography. 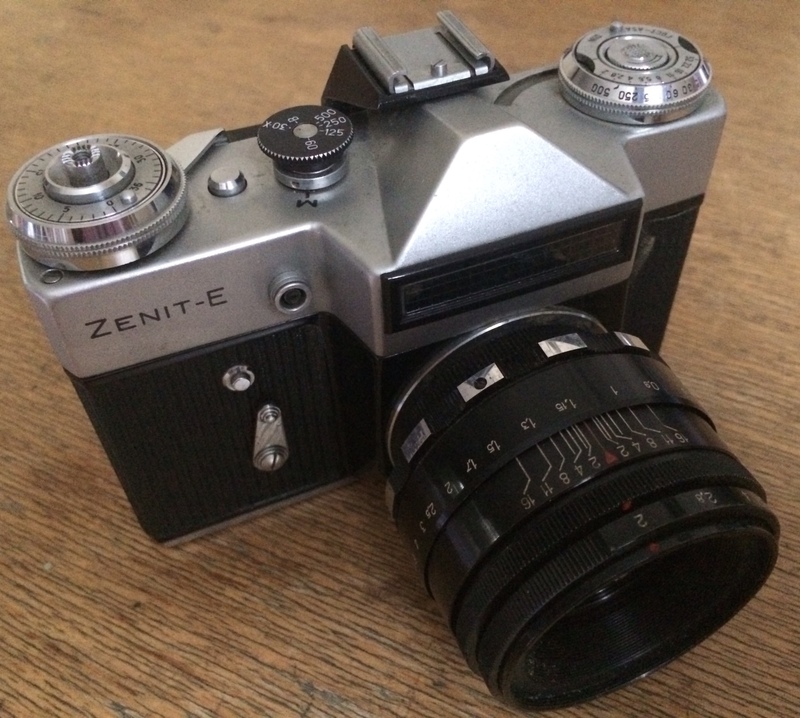 Third, despite being at the cheaper end of the range, the robust Soviet-era Zenit was still a big investment for something which might well end up unused on a shelf. In the event, I was very impressed by the Zenit and its potential. I learnt each of the rather cumbersome steps of the picture-taking process and managed to bring them together and master the skill of producing a decent photo and took many hundreds with it over the years. It was hard work but it was worth it and I still have some of the contact sheets of 35mm film which I would get from the chemist from which to choose which pictures to print. Handling my Zenit again this summer after such a long break reminded me that I really loved that camera. I started to wonder what it was about acquiring that particular skill which worked well as a learning process compared to other, less successful attempts. It was unplanned and unexpected and it started with the challenge represented by the equipment itself; could I master this exciting but rather bewildering piece of kit? It also came via my dad, although he was not an expert photographer. He helped me at the beginning, but this was always going to be my camera and my skill, in contrast to clarinet-playing which I enjoyed but which my dad was so good at that there seemed little prospect of ever ‘catching up’ however much I worked at it. Also, with the Zenit, the results could be appreciated within a reasonable timescale as film could be processed and photos printed within days or weeks. There were many other skills which I didn’t stuck with, like painting where I couldn’t cope with the puddling of the watery poster paints at school and the wrinkling of the paper they caused, chess which I could tell would be a really long haul or football where I just didn’t have the necessary tolerance of mud or jostling. The skills needed to use the Zenit-E are now redundant and I can take serviceable photos with my smartphone without worrying about shutter speed, light intensity or f-stops. Even if I used a great camera the process would be automated and the skills needed would be very different. But, in learning to use my Zenit, I also learnt wider lessons about the need for effort, concentration, reflection and practice as well as quite a bit of physics. I could, and did, learn some of these things in other contexts too or in more systematic and planned ways, but not all learning happens on cue. My Zenit was just one way in to the pleasure of mastering a skill and doing it well. That’s why finding it and handling it again meant so much to me. Also it reminded me of my dad. This entry was posted in Teaching and learning and tagged learning, skills, Zenit-E camera. Bookmark the permalink.